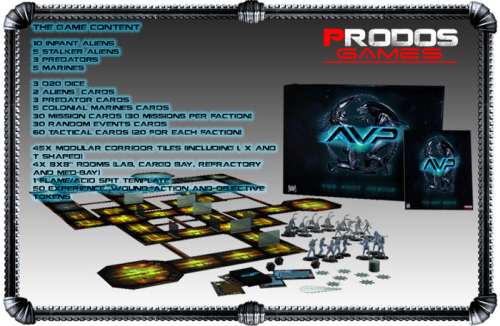 “If successful this KS project will allows Prodos Games Ltd to produce the AvP The Hunt Begins Board Game (which will be produced in standard plastic 1 piece format for late 2014 release) in a bespoked and limited (to KS) fashion specifically for the model connoisseur and collector alike. We will utilize our Procast model making technique to make the high quality and detail multipose and official 28mm polyurethane miniatures of these seminal icons of screen and prose. As well as the cutting edge miniatures, the KS Exclusive AvP The Hunt Begins Gamers Collection Edition will be packaged in a deluxe KS-only box and include exclusive tokens and cards. By donating £75 then you will be effectively paying for a special KS version of the initial box release with lots of resin models in various poses. Many of the extra goodies have been unlocked with much more on the way! I’m breaking my Kickstarter virginity on this and I hope many of you will be joining me! The campaigns ends on the 28th of November. Get donating!! Not gonna lie, I really didn't expect them to hit 2000 backers. I don't even know what I want at this point - they've given away so much free stuff as stretch goals and added on so many other new miniatures that I'm interested in, I'd have to go back over the KS page to figure out what I'm even getting at this point. I didn't expect it to go where it did either. Neither in backers nor amount. Glad it did but would have liked Prodos to throw something else inbetween those new goals. Probably figured they didn't need to. The incentive already existed and time was running short. Agreed. And from the sound of it, you got way more than I did! Don't feel bad man! We all have our hobbies, we should be able to enjoy them. There's always time to spend money on things we have to, but not always on things we want to. Besides, this is a limited edition worth of stuff! It'll be worth it. The game sounds like a ton of fun. Just hope it's not too overly complicated. I don't mind learning but those I intend to teach might! Thus why I made sure to budget the rulebook in. Much easier to reference than a PDF. I haven't personally finalized my choices but I'm pretty sure I want the rulebook, Queen, Crusher, and Young Bloods while getting the Predalien, Praetorian, Warriors, Facehuggers and Eggs for free. Also threw in an extra £15 for either the Power loader, Predator tiles, or an extra set of Marines. Haven't decided yet. I spent way too much money on this...but I'm getting at least one of everything, which I just had to do. Circumstances providing, I will continue to do so as they expand the line in the future. Funny, you're not the only one! I watched it right up to the very end! Sadly I don't think we'll get to 2000 backers for another add-on. Of course we will! Predator Ship already unlocked, Dog Catchers already unlocked, Double-sided tiles are just a bit away, and still 2 hours to go! He'll yeah! EDIT: We've passed 2000 backers, and are less than 8K from the Double-sided map tiles goal. Can you guess which AVPG member is spending his Thanksgiving off watching the KS page? I donated at the "Real Aliens Ain't From Mars" level. I think that'll be enough to get me at least one each of all the add-ons I want, without breaking the bank. That's what I did. The extras are useful since I would have wanted those anyways! Can't wait for this. The queen is almost unlocked! I'm in at the "Payback Time" level. I reckon I'll spend my open addons and extras on Warriors and sentry guns, mostly. With the free Praetorian goal breached, I'm unsure weather to get two and a Predalien or just the free one and a Queen. Also fun fact: their "concept art" for the Young Blood Predators is actually the campaign ending screen for the Predator campaign in the AvP Evolution mobile game. 53 hours to go on the KickStarter. Who else is actually in on it? Praetorian is looking good, plus it seems like I'll be getting two now! Ive got a bunch of pictures too. Already put some up on my Twitter, will put the rest up later and get a little article done. Im at an Attack Wing tournament today so will be this evening. Argh, I'm not on Twitter. Can't wait for your article later though. As for that terrain, as nice as it is, I can't justify spending money on cardboard terrain ever again... New Zealand is just too damp, and I can't exactly afford well maintained flats. It's the £78 'HULK' add-on, pledge £1 and add the extra £77 for this set. It was made specifically for the AvP kickstarter going by comments on the KS. Nice pics.. anyone have an idea of where one can get this cool battlefield? 3D rotating video of the Praetorian. So is this like Axis and Allies? When you have miniatures with cards and you use them as your own team against someone else on a map? I collected Axis and Allies (started up a Canadian Army in fact) and Star Wars for a while, but later realized it's better when other people play the stuff too, and eventually lost interest. someone had mentioned about making a chess set out of this , anyone had any thoughts on how they would do this ? It shouldn't be that hard - you'd just need enough miniatures to represent the chess pieces (you can decide which miniatures represent what) and then get a chess board. I mean if you wanted to get all fancy you could try and make a custom chess board, or mount the miniatures on special bases (or even wooden bases, if you could find some - a craft store might have something suitable). Also cancerblack I gotta say your avatar is creepy as hell. What, this little guy? He's adorable! Wouldn't hurt a fly. The entire spreadsheet for the Pledges in addition to the goal marks has been revealed. Check the Kickstarter link. Been unlocked for a while I think. I'm interested to see who they put inside the Power Loader. My bet is a marine, since they've been iffy about civilians in general so far, not just named characters. Really hope we get to the free Praetorian stretch goal though, that thing rocks, and it'd free up money for more rank'n'file. Who doesn't love the Son of Godzilla? Also, yeah me too. I'm trying to sell some crap on eBay to allow me to throw money towards the pledge. I'd very much like a free Praetorian!!! I dunno, I think their Alien models look pretty slick so far, I'm looking forward to seeing what else they come up with. I do agree that I'd rather see WY as a faction over "Stickman", but part of that is apprehension of what they'll do by creating the Stickman faction from whole cloth. They're going to be creating an entire (theoretically, fully formed and balanced) faction based on 1 creature that got 3 minutes of screen time. I mean I kinda get why they'd roll WY in with Humans/Marines, because I imagine they wouldn't play that differently. But there's ways to make them play differently and give them special rules and equipment, similar to how Space Marines and Chaos Space Marines play differently in 40k despite technically being the same thing. The whole Stickman faction thing reminds me of when the Starship Troopers miniatures game introduced the Skinnies as a playable faction, and the creators basically had to make up the faction from scratch because the source material (TV series and Heinlein book) didn't say a whole lot other than "they exist". Mongoose had permission from Heinlein's estate to make what ever new races they wanted as long as they approved them, the skinnie hargemeny was created from Heinlein's own notes. They also made 2 other races as well.One that was finished, The Forth, and one that was in the prototype stages, The Coven. I'm sure the stickman figures will sell really well. Btw... the redesigned Predalien actually looks worse than Chet.. with even bigger dreadlocks. lol. Way to mess something up even further. Did anyone bring that up during the live Q&A? The quality of the sculpts for the Aliens is really good. I'm impressed with how much detail they've got. But the designs ain't what they say they are. They said the "Infant Warriors" are the Alien design and we've seen their Infant Warriors models. They're AvP. The Alien models so far look really half-assed and the so called "Infant Warriors" look like absolute crap, esoecially compare to the Marine and Predator models. The "Stalker" torsos, tails and heads are fine, but the legs and arms are atrocious. I'm less concerned about Perry being the writer as the makers not being able to tell the difference between the Alien and AvP designs. Shows a lot of love and attention to detail there. I just hope their abilities are balanced well. I've temporarily changed my tune on that, in the hopes that it's just some IT guy googling the word "aliens" and making the temp banners. I probably shouldn't, but I'm holding out hope that when they release the renders for the Warriors, we'll get a pleasant surprise. Still not happy that Steve Perry is the story writer of this project. Really don't dig his stuff, especially when it comes to anything related to ALIEN. Fourth faction not being W&Y (or Engineers)? ...Really don't like the sound of that. The Arcturians are most likely just humans (a colony of transgendered / androgynous people or something like that) and not some Star Trekk alien species. Wow those are some pretty great minis.Female pred is weird though. Also what the hell is stickman?? I assume it is that river ghost thing from predators. Yeah me neither. I mean I'm willing to give it a go and see what happens, but I'm also not exactly hopeful. They could dig into the EU and make another faction if they wanted - the Leading Edge' Aliens RPG has a couple ready to go for them (the Harvesters, Arcturians). IMO having a 4th race would be interesting,as long as it is done correctly. I can't say I'm thrilled by that idea. Power Loader, "Youngblood" Predators (AvP, presumably) and Crusher Alien all confirmed. Yep. It was mentioned in the Q&A section - someone asked if W-Y would be added as a fourth faction, and they said no - that W-Y would be lumped in with marines, but that they were looking at adding factions somewhere down the line by digging really deep into the IP, and that the first thing they were looking at was stickman (presumably since he's the only living alien outside of Xenos, Preds, and Predhounds we see in any of the films, as they don't have the Prometheus license). Not to mention potential eventual fourth faction based around stickman.